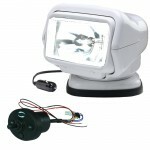 This is a name brand motorized spotlight that is priced lower than MAP (minimum advertised price set by the manufacturer), so we can not use the name of the manufacturer to promote this product. This is a new item. 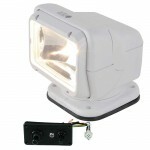 370 degrees of motorized rotation 135 degrees of motorized til Permanent mount spotlight Wired dash mounted remote with joystick 65 watt bulb, 5.5 amps 400,000 candlepower 20' Wiring Harness with Quick Disconnects Mounting Hardware included Unit Size: 7" x 7" x .. 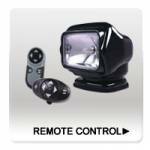 This is a name brand remote control light that is priced lower than MAP (minimum advertised price set by the manufacturer), so we can not use the name of the manufacturer to promote this product. This is a new item. 370° Rotation 135° Tilt 500,000 Candle Power 5.5 Amps UV Ray and Saltwater Resistant Integrated 12V DC High-Torque Motors Weatherproof for Land and Sea Applications Waterproof Transmitter R.F. Programmable Super Heterodyne Receiver RockGuard Cover and Stainless..